A recent drawing, a collage of drawings really. 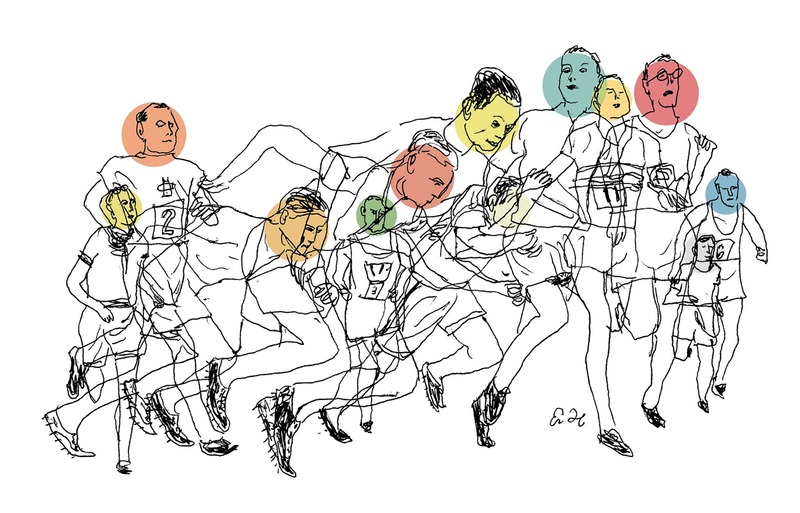 I like the cat's cradle of lines I can get by overlapping the drawings this way in Photoshop. The colored dots help differentiate them. In a way it's like the montages from films of the 1930s. We'll see how many different ways I can use this. It's been a difficult month, so let's reward ourselves. 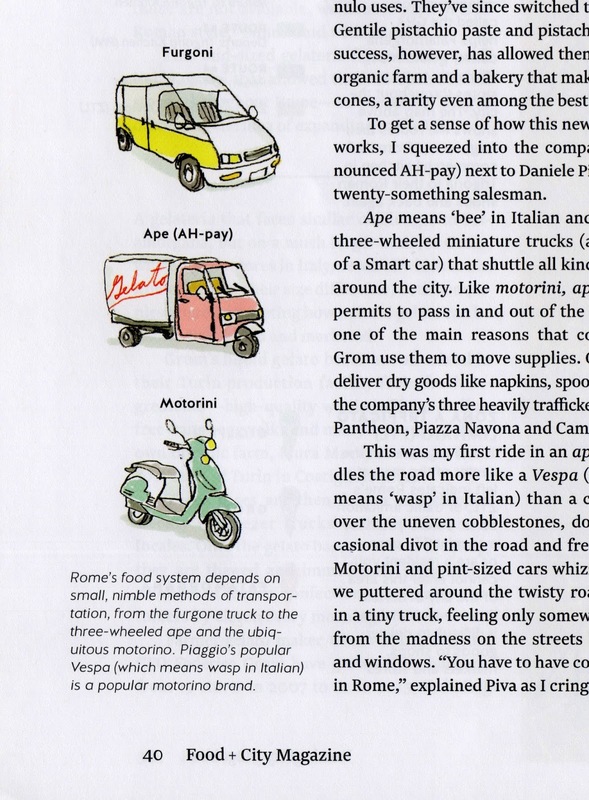 I did these gelato delivery vehicles for an article about the logistics of gelato in Rome. Design by Pentagram/Austin. The art director was Julie Savasky. Eric Hanson has been an illustrator and writer for more than twenty years. His artwork has appeared in the New Yorker, McSweeney's, Rolling Stone, Vanity Fair, Spy, the Atlantic, Harper’s, the New York Times, Travel & Leisure, Gourmet, the Believer and other publications. 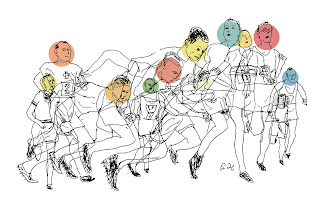 His work has appeared regularly in juried annuals from Communication Arts, Society of Publication Designers, Luerzer’s Archive (200 Best Illustrators Worldwide,) Print, I.D., A.I.G.A., and American Illustration. Design clients include, Aesthetic Apparatus, Duffy, Robert Valentine, Pentagram, Ogilvy, Stoltze Design, AirConditionedLA, Fallon, Paul Davis, Louise Fili, Kate Spade, Barney's, Tolleson, Landor, Willams Sonoma, Barneys, Nordstrom, Target, Alfred A. Knopf, Farrar Straus & Giroux, New York Review Books, Chronicle, Random House and Pantheon. 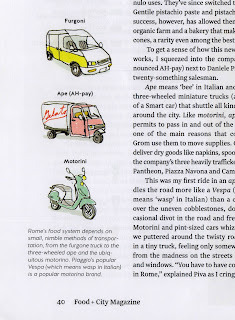 The illustrations and text on this blog are the property of Eric Hanson, who holds the copyright©. His fiction and satire have been published by McSweeney's, the Atlantic, Süddeutsche Zeitung Magazine, The Paris Review, and others. He is the author of A Book of Ages, which was published by Random House in 2008.